"TourHip!" 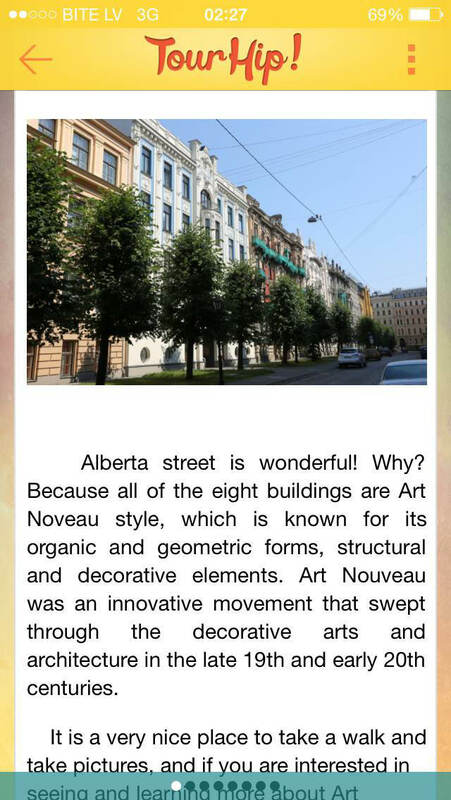 is a unique mobile app about the capital city of Latvia - Riga - in English, which provides tourists with interesting and exciting travelling experience on a smartphone or a tablet. "TourHip!" allows its users to get to know the country, its culture and the language better. The sections include "Must see", which contains a brief description and photos about the most important sites and events in Riga, "Must do", a mini-dictionary titled "Must learn", "Did you know? ", featuring interesting facts facts about the city and "Must hear" where you can hear most important casual phrases in Latvian that are accustomed for the communication of the tourists. "TourHip!" is based on the results of the survey about the most recommended sites by the locals and is updated with new sites almost every week!